Svendsen Marine is a custom boat-building business in Southeast Alaska, specializing in ﻿heavy-duty, all-welded aluminum, with over 35 years of success designing and building more than 400 quality boats. Sizes range from a 20' Skiff to a 45' Sport Cruiser. Our heavy-duty boats are built to withstand the rigors of the water, even the rough seas and adverse weather conditions Alaska can throw at you. We design, custom build and outfit each boat to the client's specifications. See examples of previous builds in the menu to the left. Our Landing Craft is a client favorite, each built to the size and cabin configuration of the customer's choosing. We can help you convert or otherwise modify your fishing vessel. Other types of aluminum fabrication and welding can be done at our facility, including dock ramps, top houses, pilot houses, bulwarks, decks, tanks, masts, trolling poles and much more. Don't wait for the boat you've always wanted. Our facility is located on the beautiful island of Wrangell in the heart of the Tongass National Forest within Southeast Alaska's Inside Passage, part of the 300-mile-long Alexander Archipelago, comprising the "Panhandle" of Alaska. 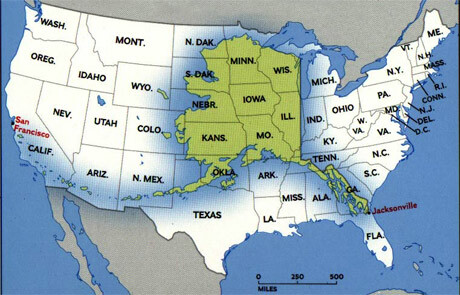 If it were overlaid on the Lower 48, Alaska would stretch from San Francisco, California, to Jacksonville, Florida, with 6,640 miles of coastline.